Join Me as I travel the world, visit exciting destinations, and share the beauty and wonder that abounds... 123 countries and counting. Visited Acuna, Mexico and Del Rio, Texas for the 2nd time, my last trip there was 8 years ago, Del Rio what was a sleepy town now has attracted Chain stores, supermarkets and big car dealerships, what a change in 8 years. I stayed at the same Holiday Express I stayed 8 years back. Check booking.com for prices. Acuna - what was a dead border town is now a busy town, new OXOX stores (convenience Stores), I saw 3 and what a change overall, I didn't carry a camera across the border this time. so no recent pictures of Acuna, I was there for about 3 hours, took a cab both ways. The immigration check points both ways is quiet busy. Cabs both ways cost twice as much compared to 8 years ago. About 15 to 20 USD for taxi each way. Question I was asked, is it okay to do a land crossing into Mexico. Answer is with all the harassment you'll face coming back its not worth it, then again I am of Indian decent. Spent the Thanksgiving holiday in the border towns of Acuna, Mexico and Del Rio, Texas. Its a 4 hour drive from Austin. I stayed at the Best Western in Del Rio, was comfortable enough. Plenty of parking. Breakfast was included, not really a breakfast its coffee and doughnuts, I kind of expected that. Good enough. Border Towns are good for shopping, clubs and great cheap places to eat, not much of a real Mexico experience, since I live a few hours away I'll be making a lot more trips. Acuna – The Mexican immigration just waved go and did not stop us. 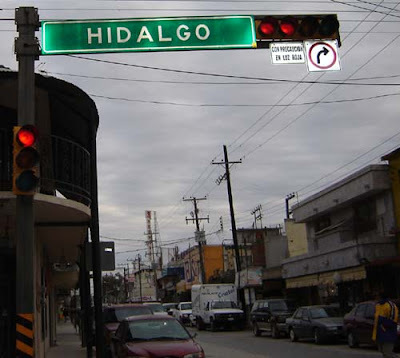 The main Street is Hidalgo, there are shops selling souvenirs, blankets, boots, alcohol and other stuff, I am not good at bargaining and didn’t care to shop. If you want to go to the clubs, Corona is a good one. There are few others. For food I ate at Crosby, I really liked the food authentic Mexican, $20 for dinner for 2. I ordered Garlic Fish. If you want to go clubbing, go late in the evening, during the day they are empty. Safety - I found Acuna to be very safe for tourist. There were a lot of Tourist that drove from Texas to Mexico, If you are going to drink, take the Cab. The cab between the borders costs US $10. There are parking available at the US, its secure and safe. If you are not a US citizen and traveling on a US VISA or a even with a Green Card, get ready to spend an hour at the US immigration. © arvinder.com. Powered by Blogger.